Sire to the 2017 ADGA National Champion, 2017 Best Udder, and part of the 2017 Best Dairy Herd, CH Old Mountain Farm Merriment. Bold Elk is also the sire the to the 2018 ADGA Reserve National Champion SGCH Old Mountain Farm Shy Elk. 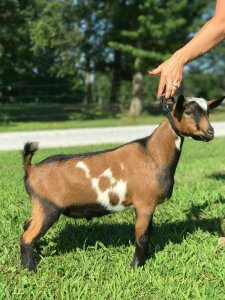 He is the full brother to SG =B Old Mountain Farm Bold Elk, who is also the 2018 ADGA Premier Sire. “Judge” is part of the Young Sire Development Program.